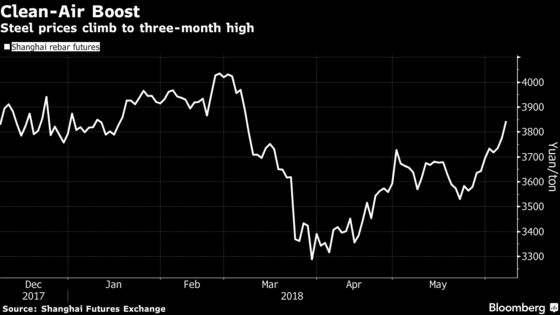 (Bloomberg) -- Steel futures in China climbed to the highest level in three months as the world’s biggest producer broadens environmental checks on industrial facilities and inventories extend their decline. Reinforcement bar on the Shanghai Futures Exchange advanced as much as 2.5 percent, the biggest intraday gain in five weeks, to 3,869 yuan ($605) a metric ton. Futures are up over 15 percent from a nine-month low at the end of March. China is pressing ahead with a new campaign to force manufacturing to clean up operations and improve the environment. The government will be conducting inspections, each lasting a month, on industrial plants in 10 provinces, according to a statement on May 25. Checks have started in Guangzhou, Yunnan and Inner Mongolia. The nation makes half the world’s steel. While demand typically slows in June because of high temperatures and frequent downpours, shrinking inventories and the inspections will continue to push up prices, Huatai Futures Co. analyst Sarah Zhao said by phone. Supply may decline going forward as mills conduct maintenance for environmental reasons, said CRU Group steel analyst Alex Ji in Hong Kong. Rebar inventories in China have been declining steadily since March, and were at 5.3 million tons last week, the lowest since February. Rebar futures closed 0.8 percent higher at 3,807 yuan on Thursday.